The small round green fruits of Denniston's Superb look like typical green gages, and have the classic rich gage-like flavour. However this variety is now generally considered to be a true European plum, on the basis of its upright growth habit and reliable cropping. These niceties need not bother the gardener - if you want a green gage without the fussy demands of some other green gages, Denniston's Superb is a good choice. 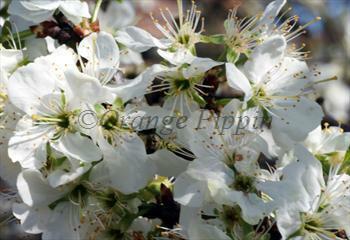 By the standards of fruiting plums it also has particularly attractive blossom. Rated by the Victorian writer Hogg as "a first-rate dessert plum". Please fill in the details below and we will let you know when Denniston's Superb plum trees are back in stock. A well-known yellow gage, a good complement to Denniston's Superb. A popular English green gage. A traditional French green gage. Relatively vigorous for a gage.? Denniston's Superb is in flowering group 2. Denniston's Superb is self-fertile and does not need a pollination partner, although fruiting may be improved if there is a compatible tree of a different variety nearby. 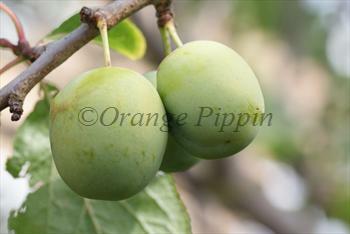 Although the round green fruit resembles a green gage, Denniston's Superb grows more like a plum tree - upright, quite vigorously, and with good disease resistance. The long whippy branches soon adopt a weeping habit when loaded with fruit. Denniston's Superb produces a lot of pollen over a long period in the earlier part of the plum blossom season, and is therefore an excellent pollinator for other early and mid-season flowering plum varieties. Raised by Mr Denniston of Albany, New York, USA in the 19th century.